Diamondback Airen 1 2014 edition is a road bike designed specifically for women which offers superb ride quality coupled with speed and comfort. This bike features Devine Design which keeps in mind all the needs specific for women and aims to deliver a superior overall ride experience. Devine Design coupled with Diamondback’s Enhanced Performance geometry focuses on comfort and quality and makes this bike stand out from the lot in terms of performance. The bike comes with a Devine Custom Fully Butted 7005 Alloy Frameset which makes the bike light as well as strong. The DBR Performance alloy fork does a fantastic job in absorbing the undulations of the road and offers a smooth and enjoyable ride experience. The Shimano component equipped drive train of this bike allows fast, efficient and effortless shifting while its Michelin dynamic sports tires offer reliability coupled with performance. This bike is perfect for weekend or club rides while its smooth ride quality makes it an ideal commuter bicycle. The price point at which this bike is available is unrivalled and if you consider the set of components used to construct this bike, you will straight away see that this bike is quite a deal. The Airen 1 is another offering by Diamondback. 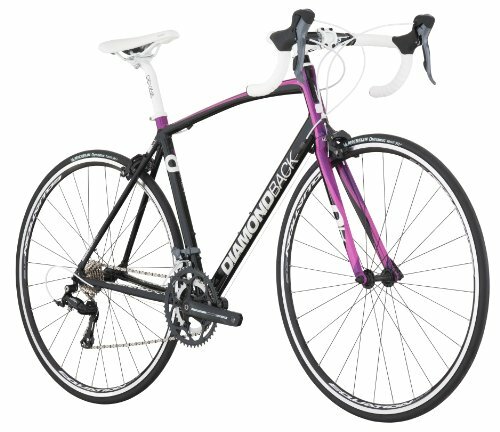 This bike has been designed specifically for women and has very similar performance to its cousin Diamondback Airen2. The Airen1 comes with a very similar frame as in Airen 2- a fully butted 7005 alloy frame designed with Diamondback’s EPG. This bike offers a smooth and enjoyable ride experience. While the Airen2 comes with Shimano 105 series shifters, this one comes with Shimano 2300 Series Dual control shifters. Shifting is quite smooth and precise while the Tektro R312A dual pivot brakes do their job with efficiency. The overall performance of this bike is quite good and on par with its cousin Airen 2. There are some differences in the components which make the Airen 2 costlier than the Airen 1. This bike offers to you a smooth and enjoyable ride experience coupled with speed and superior comfort. The Airen1 as well as the Airen 2 are both excellent bikes and it is recommended to go through the list of components of each of these bikes before deciding on the right choice.